Cooking and eating in a foreign country may be the surest, truest way to its soul. Arriving in Salvador, you quickly adjust to the sights and the sounds of Bahia. The colourful clothes and buildings, the sounds of laughter and music, the joie de vivre that oozes, with salty sweat, out the pores of all that inhabit this beautiful northern corner of Brazil. On a warm balmy night we took a stroll along the promenade past the bars that lined the ocean. Free from chasing shadows, the setting sun brought the people to the street: ageing drummers nursing ice-cold beers, young lovers sharing hands and soft kisses and families enjoying their last day of summer. Seaspray carried on a gentle breeze, but it was the aroma of a thousand kitchens which swept over us. You can touch, see and explore Brazil until your end of days, but you simply do not know this country until you have tasted its food. The heat of a malagueta chili pepper and the unique flavour of dendê oil, plump shrimp eaten with lashings of bitter-sweet lime juice and garlic, coconut cream and perfect little mountains of manioc flour. The food of slaves that lives on in the hearts, streets and homes of Brazil. We spent three weeks in Bahia, burying tanned feet into cool white sand, a cold coconut perpetually at our side. We ate plate after plate of tapioca, fresh fish, black beans and acaraje but knew we couldn't leave Brazil without learning to cook the most famous of dishes, Moqueca. This delicately spiced coconut milk and seafood stew is the most iconic of Bahia's cuisines and a must-try for any visitor to the country. Fortunately, just days before we left Brazil and headed back to the UK, we were invited to learn from the best, with Simone at Cook in Rio - the foremost cooking class in Rio de Janeiro. Much more than your average chef, Simone is a true Carioca who bleeds Brazilian charm. Importantly, in a class where you do not create your own individual dish, she is captivating. Her country's history and present is somewhat chequered but this melting pot of cultures is what makes its food so unique. Every step has a story and she teaches us not just how to cook, but why every ingredient, every method, is just so. As Simone says, "to understand Brazil’s food you have to understand it’s people." She certainly understood us. With a kitchen full of Canadians and Brits, Simone began at the most logical point, with a caipirinha. Now, we're not newbies when it comes to the caipirinha. In fact, bars and restaurants all over the world have been selling butchered concoctions under this name for many years. Armed with a cheap bottle of cachaca, ice-cold Sprite and a few lime slices, we cannot deny that we've done the same. But to learn how to make one in Brazil and from a Brazilian, well, six weeks in the country had still not allowed that. It turns out that we had been doing it all wrong. And as shocking as it may sound, we hadn't been adding NEARLY enough alcohol. The funny thing however, is that if you make a caipirinha properly, the cachaça is actually quite pleasant. Perfectly ripe unwaxed Haitian limes, heaped teaspoons of sugar and a little bit of elbow grease (you really want to batter those limes! ), followed by a five (yes, FIVE) second glug of good cachaça - or bad, if you can tolerate the hangover - over ice. And then mix. We got a chance to make both a traditional and a passionfruit version, and both were delicious! And then out come the appetisers. Queijo coalho, a halloumi like cheese lightly pan-fried and served with spicy guava jelly and a delicate spongy cheese beautifully complimented simply by good olive oil and oregano. And for the meat-eaters, linguiça sausage with a freshly made salsa, one of the few things that we add heat to. Simone teaches us early on that Brazilians prefer to add spice at the end, explaining the reason for the small pot of fiery sauce common to every table across the country. The sausage is devoured in minutes, a feat owed perhaps to its method of cooking. Just minutes before the class feast, the meat was quickly seared flambé style with oil and a dash of cachaça. It becomes clear early on that Brazilian food is not complicated; there are no arduously long lists of specialists ingredients and hours of preparation time. It is simple ingredients with bold flavours. And more often than not, it is about colour; Simone reminds us that every plate should be like a rainbow. On every table in Brazil, right next to the picante, is a small bowl of what looks like corse breadcrumbs. The first time we saw it, we thought it was fancy salt. When we realised it did nothing to flavour our fries however, it just sat there, ignored. Farofa (coarse cassava flour) it turns out, does have a purpose (to mop up the sauce) but we suspect there are a lot of confused gringos right now staring at a similar bowl of 'breadcrumbs'. For tonight's meal however, the farofa was to be toasted and mixed with deliciously sweet bananas. An odd combination perhaps to those not used to Latin American cuisine but one that is incredibly tasty. "When you talk about moqueca, I think you talk about a whole culture that's represented by the Africans in Brazil." 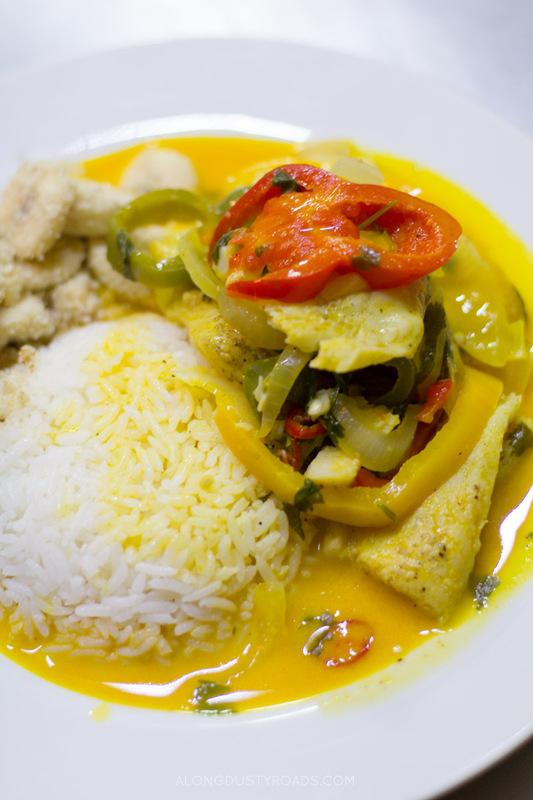 Topped up with a further caipirinha, we move on to the moqueca, a simple stew of fresh fish, golden oil and coconut milk but the epitomy of Bahian cuisine and the embodiment of Brazilian history. As our chef seasons fillets of white fish with fine ground pepper and fresh lime juice, her stories turn to the past. With strict instructions and two sharp knives, the class slice perfectly round peppers in yellow, green and red and mountains of cilantro as we learn the origins of dendé oil and the 300 year old slave trade that brought it to the shores of Salvador. The peppers and onions simmer on the stove, until thick coconut milk and the honey-coloured oil are poured into the pan, coating the colourful vegetables in a deep, earthy hue. The unique aroma wafts up from the pan, filling our small kitchen in Rio with the smells of Bahia, a scent that will recall balmy nights and African beats for many years to come. The lid is placed over our evening's dinner and the conversation goes on. The wonderful thing about Simone's classes is how quickly she turns strangers into friends, if only fleetingly. Whilst we may have come as a couple, it is the sort of environment we could happily attend without each other, safe in the knowledge that independent travellers would not be isolated. Dinner was served family style, and after a flurry of camera phone flashes, we all ate. After three hours of preparation, the food disappeared in minutes. Brazilian food, it seems, is popular with all nationalities. With clean plates and full bellies, we had but one dish left to try - the brigadeiro. For weeks we had had little balls of chocolate proffered at us. From small children in the street, hippies at the beach, and from the windows of beautiful chocolatiers. And still, we were yet to try them. An indulgent combination of condensed milk, butter and cocoa powder, when Simone informs us that this is the sweet of slumber parties, birthdays and break-ups, we are hardly surprised. Decadently dark, this thick fudge-like mixture clung to individual dessert spoons, a determined tongue required to remove the last trace. Of all the foods we tried this evening, it is of little surprise that this is the dish we have both recreated since returning home. It may be sometime before we venture back to Brazil, but at least we can create a little taste of this magical country anywhere in the world. Huge thanks to Cook in Rio for providing us with two complimentary places on one of their cooking classes. Run by Simone, an enthusiastic Brazilian chef, these three hour cooking classes will give you a great insight into the country's culture and cuisine. The classes run Monday to Friday at 4 p.m. and Saturday at 11 a.m. with the option to learn how to cook seafood Moqueca or Pork Feijoada (dependent upon the day of your class). To book, head over to the website and fill in a contact form.